CCAC Gives You More Exciting News About MidAtlantic Wine+Food Festival! Delaware Today calls the Festival "The event of the year." We're proud to be part of this extraordinary event, which draws chefs and winemakers from around the world for dinners, tastings, cooking demonstrations and more. The Festival's chef list boasts more than 20 regional chefs from the best kitchens in the area -- including Eric Aber from Home Grown Caf�, who will make an appearance at the Wine + Chocolate event hosted here at CCAC! Buy tickets and support Christina Cultural Arts Center by designating our organization to receive a portion of your purchase when you check out. Buy tickets and support Christina Cultural Arts Center by clicking here! P.S. Events to keep your eye on! Acclaimed pastry chef Dana Herbert, winner of TLC's "Next Great Baker," pairs his delectable creations with beautiful dessert wines, in the sweetest tutored tasting of the weekend. 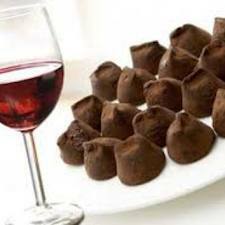 This sinfully good tasting pairs wine with gourmet chocolates crafted by Swiss chocolatier Albert A. Lauber of Neuchatel Chocolates in Oxford, Pa. (Some marriages are made in heaven.) Click the link above for ticketing information! The sounds, sights and smells of South Africa will fill the Festival Village at this braai (barbecue), a traditional social gathering that brings people together over a plate of beautifully grilled meats (and a few sides) overseen by Hugo Uys, the famed restaurateur from Johannesburg. Join dignitaries from the South African consulate at this exciting cultural event, with music, art and a variety of exceptional South African wines.